St. Petersburg Mayor Rick Kriseman says he still hasn’t heard from Tampa Bay Rays owner Stuart Sternberg about whether he wants to try to build a new stadium in St. Pete, and he’s getting impatient: “The [Pinellas] County Commission oversees those TDC [Tourist Development Council] dollars and they’ve indicated they would keep that money in a lock box, but it’s not going to sit there forever.” That’s a new tactic — we have tax money for you, but you have to act now — and it’s not really clear what Sternberg is waiting on, unless he’s still hemming and hawing about whether the reason nobody goes to Rays games is the St. Peterburg location or the Florida location or the fact he’s a lousy owner. Regardless, the Rays will still be in St. Pete through 2026, and after that it’s anyone’s guess, as the Tampa Bay Times concluded in the world’s most boring roundtable. The Miami Marlins debuted some changes to their much-reviled stadium this week, including a standing-room-only section in right field that team owner Derek Jeter says is designed to appeal to young people: “A lot of times fans come to games and they don’t necessarily want to sit in their seats. They want to be able to move around, especially the millennial — the younger generation.” Uh, Jeets, there may be other reasons than millennial ADHD that Marlins fans don’t want to sit and watch the game. The Milwaukee Bucks‘ new arena that opened last fall has already needed $3 million in upgrades, including bigger cup holders in the lower-level seats because the old ones “can barely hold a cup of coffee.” All together now: Just tear the place down and build a new one. Here is a trash article in Bloomberg in which Golden State Warriors team president Rick Welts asserts that the team has already made $2 billion from its new $1.3 billion San Francisco arena “in the form of tickets, suites and sponsorships” before the doors have already opened. Is that for its first year, or does it include multi-year commitments? And how does it compare to what the Warriors would have brought in from those revenue streams in their old Oakland arena? Despite the article taking two people to write, neither of them seem to have bothered to ask those questions, because writing down what important people say and leaving it at that is what journalism is all about, right? 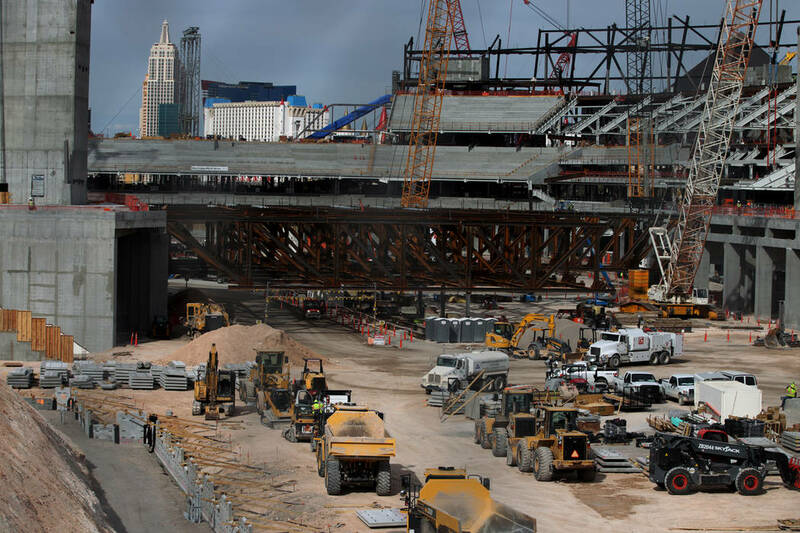 The projected completion date of the Las Vegas Raiders stadium has been pushed back from July 31, 2020 to August 4, 2020, but also not really pushed back, and besides no one knows when the first Raiders home exhibition game will be in 2020, so get off their backs, okay? Given that this is what the site looks like right now, I’d take the over on any completion date projections — if nothing else, it’s clear why owner Mark Davis included an option for 2020 in his new lease with Oakland. Nonvoting D.C. delegate to Congress Eleanor Holmes Norton has introduced a bill to sell the RFK Stadium site to the city of Washington, which would allow it to be used for a Washington NFL team stadium or maybe something else. Figuring out how much D.C. should pay for the site, though, could be tricky, because it currently isn’t zoned for any particular type of development. The local resident group Elmont Against The Megamall has proposed using the land the New York Islanders owners want for a new hockey arena for public sports fields instead. That is probably not happening, even if the state isn’t getting much money for its land either way; though another group of local elected officials, this time from Nassau County, expressed qualms about the project’s impact this month, so momentum certainly doesn’t seem to be going the Isles owners’ way. The Madison Square Garden Company wants to build a giant sphere-shaped arena in London, and … wait, haven’t we heard this somewhere before? The Olympic-quality BMX track that Tulsa is building with public money will now cost $22.8 million instead of $15 million. This is not a sentence I expected to be writing in 2019, but I probably should have. New York Islanders co-owner Jon Ledecky again stressed this weekend that his team’s arena is totally on track to open in 2021 as scheduled, so it’s good timing that I had an article run at Deadspin yesterday pointing out that yeah, it really isn’t, at least not if the elected officials threatening to block it if it doesn’t come with a full-service train station are serious, because there’s no easy way to build a full-service train station there. Fess says he got to ride to the Belmont arena announcement last season with the team’s entourage, which included both Ledecky and longtime broadcaster Stan Fischler, who moonlights as a transit expert. The resulting conversation, he says, was both enlightening and worrisome. Canadian economists have lots of questions about who’s going to pay for a new Calgary Flames arena, which is as should be because the city council won’t say yet how it will be paid for. And we apparently won’t know more for a while, because first the council needs to figure out who’ll be on the negotiating committee with the Flames, and it’s not even scheduled to meet until next month. I can’t be the only one thinking, “Excellent, lots of time for somebody to leak the details to the press before everything gets negotiated,” can I? Deadspin has a tips line, just saying! The Atlanta Braves brought in $442 million in revenue last year, for a profit of $92 million, but blamed the team’s debt payments on their new stadium in Cobb County for not leaving enough left over to spend big on free agents. After public subsidies, the Braves owners are on the hook for less than $20 million a year in construction debt payments, plus $6 million a year in rent, so, um, yeah. The latest Texas Rangers stadium renderings make the seats in the top decks look just as crappy as in the previous renderings, there are still clip-art fans with translucent heads, and the roof is open in all of them even though the whole point of the new stadium is to have air-conditioning, which won’t work if the roof is open. At least we finally get to see how fans will get to that deck suspended in midair in left field — via a brick-colonnaded walkway, of course — so we no longer have to worry about Rangers fans having to purchase jetpacks to get to their terrible seats. And still more renderings, these of a USL stadium a would-be team owner wants to build in Fort Lauderdale on the site of Lockhart Stadium, the same site David Beckham has targeted as a training site for his Inter Miami MLS team. Are there spotlights pointing pointlessly into the sky? You bet! Is this, regardless of whether the USL stadium stands a chance of getting built, yet another reason to laugh at Beckham over how he can’t catch a break? Don’t you know it! Here’s a video of what the chairs and shelving will look like at the new Las Vegas Raiders stadium. And here’s a picture of what the place settings will look like in the luxury suites at the new Golden State Warriors arena, but it’s just a still photo — come on, Ben Golliver, it’s 2019, don’t you know people want to see furniture in video form? New York Islanders owner Jon Ledecky insists that the team’s proposed Belmont Park arena is still “on track for the 2021-22 season,” but what else is he gonna say? Winnipeg will provide a total of $16.6 million in tax breaks and other operating subsidies this year to the Jets, Blue Bombers, Goldeyes, and Manitoba Moose, and bonus points to any non-Canadian who can name what sport each of those teams play. Economic Development Winnipeg CEO Dayna Spiring claimed that the public will make its money back — no, not through the taxes the teams won’t get breaks on, that’s a Wichita thing to say. Rather, Spiring said the public will earn its money back on exposure, via the value of Winnipeg’s name appearing on hockey broadcasts. Somebody please alert this Twitter account. Tottenham Hotspur stadium opening update: still maybe early April! Also, it may be called Nike Stadium, or maybe not. Wichita announced it planned to double down on its $75 million expense for a new minor-league baseball stadium for the relocated New Orleans Baby Cakes Triple-A franchise by also selling land around the stadium to the team owners for $1 an acre, with the mayor saying the city would make money on the $38.5 million in taxes the new development would pay over the next 20 years. This is still not how taxes work, but Wichita has since said it was putting off the land sale after Wichitans griped about the stealth subsidy, so I won’t belabor the point. For now. And finally, NBA commissioner Adam Silver want to make watching basketball at home more like being at the game, via “technology.” Wait, isn’t one main problem pro sports is facing that fewer and fewer people want to go to games because it’s just as pleasant and cheaper to watch games at home on their giant hi-def TVs? I mean, no complaints here if Silver really wants to replicate the smell of Madison Square Garden in my living room, but it seems a bit, I dunno, against their business model? Unless maybe this will be some kind of premium feature you only get by subscribing to their streaming service that will be described as “Netflix for basketball,” yeah, that’s probably it. About that train station: State senator Leroy Comrie, whose district abuts Belmont Park on the New York City side, last month issued a five-point list of “essential points [that] must be addressed before the ultimate fate of the project is decided,” including full-time rail service to the new arena complex from both points east and west. And this week, Comrie was nominated to the state Public Authorities Control Board, the same oversight board that killed the New York Jets‘ proposed Manhattan stadium in 2005 and more recently helped scare off Amazon from seeking $3 billion in tax breaks to locate in Queens. Only problem: Full-time rail service to Belmont Park is maybe impossible, or maybe just prohibitively expensive: Metropolitan Transportation Authority board member Mitch Pally said that the agency had priced one option at a staggering $300 million for new tracks, signals, and the works. As for Comrie, he said he was “very confident” that his five conditions “are resolvable.” Still, he said, he didn’t see anything getting resolved until well into late 2019 — and possibly not until “the first quarter of next year.” That would almost certainly preclude an arena from opening until 2022. None of this is a huge stumbling block necessarily — unless Comrie and other local elected officials genuinely insist on full-time train service being put in place by the time the arena opens and not just planned by then, in which case the geometry of space-time may be a problem. But put it all together and the odds of this Islanders plan happening seem like they’ve gone from “skids all greased” to “probable but who the hell knows.” It’s entirely possible that Islanders fans can look forward to several more seasons of not knowing which city their home games are in — that is, if the team’s owners can even talk Brooklyn’s Barclays Center into letting them stick around considering how much money the arena is losing on hosting hockey. Remind me why then-owner Charles Wang decided to move out of Nassau Coliseum for a basketball-designed arena nowhere near his team’s fan base? Oh, right: hissy fit.